A woman’s sanity fractures after she learns of a brutal murder—one only she could have thwarted. With The Breakdown, author B.A. Paris engenders a constant, ratcheting sense of unease and paranoia. Similar to her hit Behind Closed Doors (which I loved), Paris touts her prowess at keeping tension tight and the pace addictive. Before you know it, you’re drawn into a chilling story that questions everything. We meet Cass the night of a storm. On a whim, she decides to drive through the woods—a shortcut she was warned not to take. As the rain hammers hard and visibility blurs, she manages to see a woman pulled over on the side of the road. She parks up ahead as a way to offer help, but when the woman makes no indication she needs assistance, Cass worries it’s a trap and drives off. The next morning, she wakes to the news that a woman was found violently murdered in her car. Shaken, Cass begins to buckle under the guilt—worse yet, she’s receiving calls from the killer. She’s positive it’s him. He must know, he must have seen her. As her sanity unravels, she becomes increasingly forgetful about everything. Plans she made, things she bought, where she parked her car… big things and little things, and with each passing day, more things than she cares to admit, even to her husband. She’s terrified to come clean with what’s she did (or didn’t do), and the police are no closer to tracking down who killed this woman—wife and mom to two young girls. Meanwhile, her husband is losing his patience and her best friend offers no respite to a life which has become impossible to bear. Soon enough, Cass can’t make sense of what’s real or not, even as that night haunts her every thought. But when shocking truths are discovered, things begin to fall into place, connections snap into focus and what happened that night begins to become clear. I really enjoyed this book. I never got bored and I viscerally felt that sense of unraveling as Cass’ life spun out of control. The only thing I’ll mention is that I hoped for more in the story’s ending. I wanted more reaction, confrontation and impact with the twists, and I also wanted to better understand (believe) character intentions. That being said, B.A. 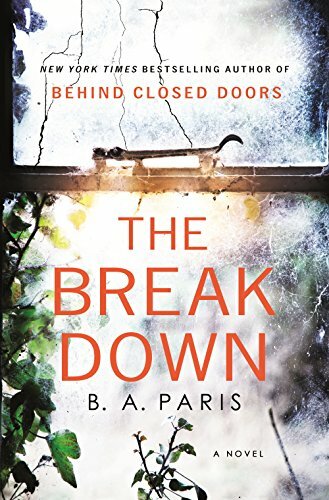 Paris has proven twice she can write a riveting psychological thriller you can’t help but want to talk about.